GERMANY KVB’s route 133 in Cologne has been converted to fully electric bus operation. VDL Bus & Coach has delivered eight articulated Citea SLFA Electrics for the service which have a seating capacity of 43 and space for 82 standees. KVB sees plenty of opportunities for the future of electric mobility and mainly focuses on zero emission public transport with a large passenger capacity. The advantages for climate change and the environment are being further developed by the company making it an important partner for the city of Cologne as regards implementation of the climate and environment protection policy. 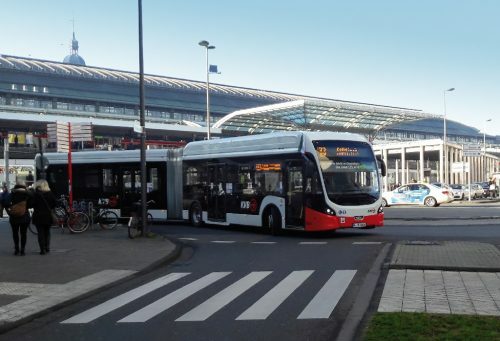 According to data from KVB, replacing diesel buses with electric buses on route 133 will reduce CO2 emissions by approximately 520 tonnes annually. Route 133, which has 13 stops on its 7km length, connects the city’s railway station with the district of Zollstock. The Citea SLFA Electric is fitted with a fast charge system using a pantograph. The pantograph is positioned on the front section of the vehicle above the second axle, so passengers always have free passage near the doors. Charging is undertaken at each end of the route. Charging power is 250kW and charging time is around 5-10 minutes. The batteries are fully charged at night. Destination displays are integrated into the windscreen, rear window and side windows of the vehicle. The entry door is extra wide to facilitate entry and egress and promote passenger flow here too. Full LED lighting at the front, sides and rear provides optimal visibility under all conditions.